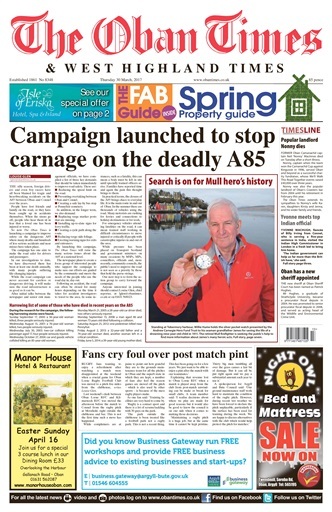 Get your FREE Sample issue of The Oban Times & Lochaber Times today! (0 Customer Reviews) | Write Review 52 issues per year Now available in digital format, The Oban Times has been bringing its readers all of the most up to date coverage of the West Highlands and Islands of Scotland for over 150 years. Reporting issues from the Mull of Kintyre to Kyle of Lochalsh on the mainland, to the Inner and Outer Hebridean Islands with Argyll and Lochaber at its heartlands. This digital version of The Highlanders’ Bible, as The Oban Times has been affectionately known, provides a contemporary and accessible platform for all to enjoy. Allowing those living in, and those who have moved away from the area, to stay informed, through comprehensive coverage, about their home towns and villages and their friends and family. Now available in digital format, The Oban Times has been bringing its readers all of the most up to date coverage of the West Highlands and Islands of Scotland for over 150 years. Reporting issues from the Mull of Kintyre to Kyle of Lochalsh on the mainland, to the Inner and Outer Hebridean Islands with Argyll and Lochaber at its heartlands. 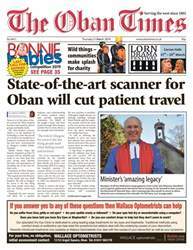 You'll receive 52 issues during a 1 year The Oban Times & Lochaber Times magazine subscription. Below is a selection of articles in The Oban Times & Lochaber Times 30th March 2017. 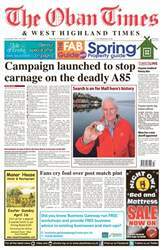 You'll receive 52 issues during a 1 year The Oban Times & Lochaber Times magazine print subscription.